KINLOCH NELSON, a solo fingerstyle guitar player, performs a synthesis of folk, jazz, classical, rock, American popular music, and original compositions. His programs range from J.S. Bach to John B. Sebastian and may include references to Miles Davis, Franz Schubert, John Fahey, Leo Kottke, The Ventures, The “folk scare,” Flatt and Scruggs, and the occasional TV theme. A composer and recording artist, Nelson can be heard on Heartland Records, BKNjr Records, Hodgepodge Music, and Sampler Records. Nelson studied classical guitar privately with Stanley Watson in Rochester NY, jazz guitar with Gene Bertoncini at Eastman School of Music and music theory at the University of Rochester. In 1973 Nelson began teaching both privately and at The Hochstein Music School in Rochester, NY where he was on the faculty for twenty-five years. Other teaching activities have included workshops at the University of Rochester, S.U.N.Y. at Oswego and summer residencies at Maryland Summer Center For The Arts. In 1985 Nelson co-founded the Guitar Society of Rochester, Inc. which during its ten-year run presented many of the world's greatest guitarists. It also supported local artists through master classes and concerts, gave thousands of bedside serenades to hospital patients through the Guitar Outreach Program, and provided consultation to the Eastman School of Music in its formation of a guitar program. Some of the guitarists presented by the Society are: Alice Artzt, Joe Pass, Carlos Barbosa-Lima, David Russell, the Amsterdam Guitar Trio, Liona Boyd, Chet Atkins, John Abercrombie, Mike Stern, George Van Eps and Jason Vieaux. Nelson has appeared in concert at The Wolftrap Center for the Performing Arts; Washington DC’s Glen Echo Dance Theater; Maryland Center for the Arts in Baltimore; National Association of Music Manufacturers in Nashville & in Los Angeles; Montreal Jazz Festival; Art Park Buffalo, NY; Time/Warner Jazz Festival in Rochester, NY; Owen Sound Folk Festival; Akron Folk Festival; Golden Link’s Turtle Hill Folk Festival; North American Folk Alliance; Fretted Instrument Guild of America; Newport, Healdsburg, Montreal and Woodstock Guitar Festivals; and appearances in Peru, Canada and Ireland. Nelson is the author of a book, Alternate Guitar Tunings. 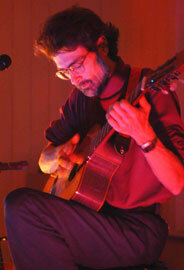 Currently Nelson teaches privately, conducts guitar workshops and maintains a performance schedule.